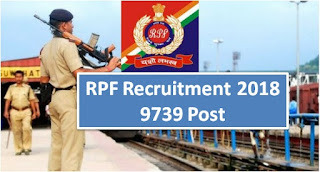 The Indian Ministry of Railways has released a RPF Recruitment for the post of Sub Inspector (SI)/Constable 2018 Notification out for 9739 Post at indianrailways.gov.in for the selection of 9,739 candidates at Railway Protection Force & Railway Protection Special Force Constable and SI posts. RPSF/RPF Application Form Submission will be started from 1st June and it will be opened till 30th June All the candidates, who desire to grab this sparkling opportunity are highly advised to keep an eye on the official website or this portal to get all the essential updates regarding it. The RRB is going to offer a ravishing opportunity via its RPF Constable and SI Vacancy 2018, by which all the less educated aspirants can grab a reputed government job.